On a crisp spring morning in Mulmur, beekeepers Jeff Chalmers and Debbie Gray are keen to show off their budding operation, the Heritage Bee Co. On my way up their lane, I passed 10 bright blue, turquoise and lime green wooden beehives. But as the three of us set off from the broad wraparound porch on their Victorian-style farmhouse, they turn north to a wooded area. Debbie stops and motions to a bee-covered hole in a tall white pine and lets out a squeal. “Oh Jeff, look! They’re bringing pollen!” She points out the yellow blobs on the behinds of the wild honeybees disappearing into the tree. “They’re trucking it in!” says Jeff. Newly installed colonies sit ready to grow at the main apiary. Photo by Debbie Gray. 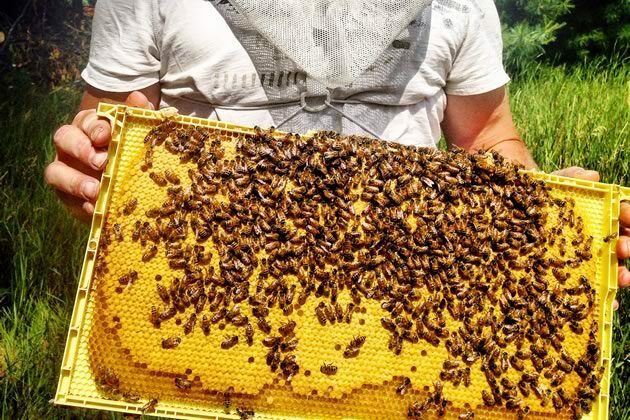 A spectacle like that might have many of us calling pest control, but for a couple dreaming of creating an apiary on their 31-acre property, it’s a good omen. These wild bees like it here. Today, for the third year in a row, it’s as though nature is giving Jeff and Debbie the thumbs-up for their pluck. 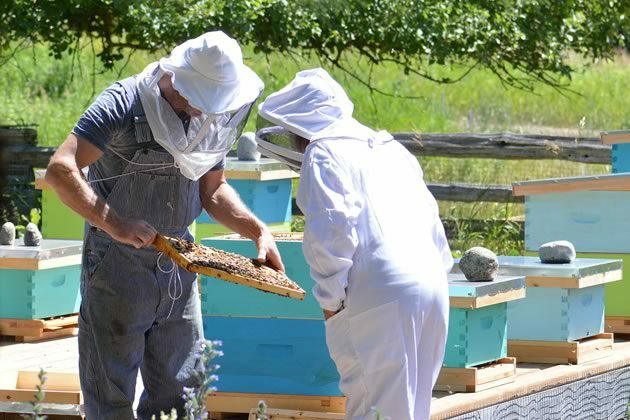 The pair – Debbie is all youthful blonde braids and glowing skin, and Jeff, with his grey hair and blue eyes, is a Paul Newman ringer – beam as they share their new life bringing bees to those who want them but who aren’t ready to become full-time beekeepers. Down the slope, those colourful wooden bee condos – they are Langstroth hives, the choice of most beekeepers – could be artists’ sculptures created to contrast with the brownish grasses that haven’t yet turned green. 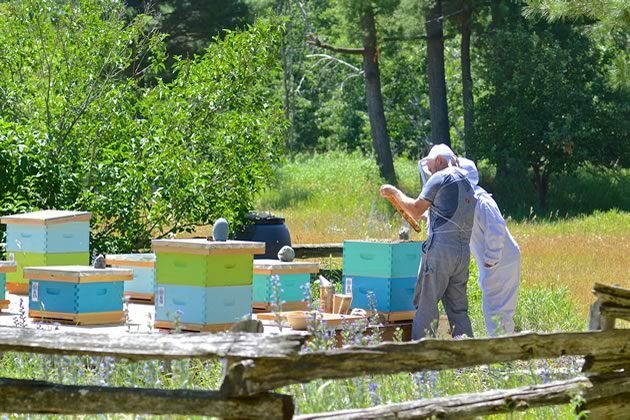 In a system akin to community-supported agriculture, or CSA, these hives “belong” to clients but remain on the Heritage Bee property, where they are managed by Jeff and Debbie. For $420 a season, the client receives about 16 pounds – roughly 20 jars – of honey, delivered in the fall. 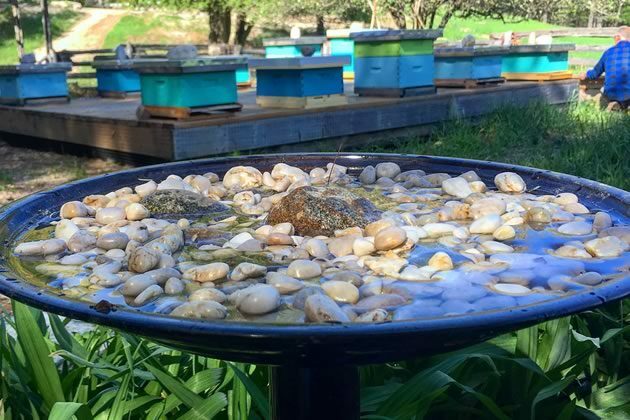 And there are perks: pollinator-attracting seed bombs for the clients’ gardens and a “VIP” viewing and honey tasting. Alternatively the pair will install hives on clients’ properties if the conditions are suitable for bees. This “you host” system includes regular visits from Debbie and Jeff to manage the colony, extract the honey and deliver jars of liquid gold. The service, which costs $960 a season, yields about 32 pounds of honey. Yes, that is a lot higher than supermarket prices for an equivalent amount of honey, but Heritage Bee is about a lot more than sweetening your morning toast and tea. “It’s not about the honey for us,” says Jeff. For one, it’s about helping to bolster a battered bee population. 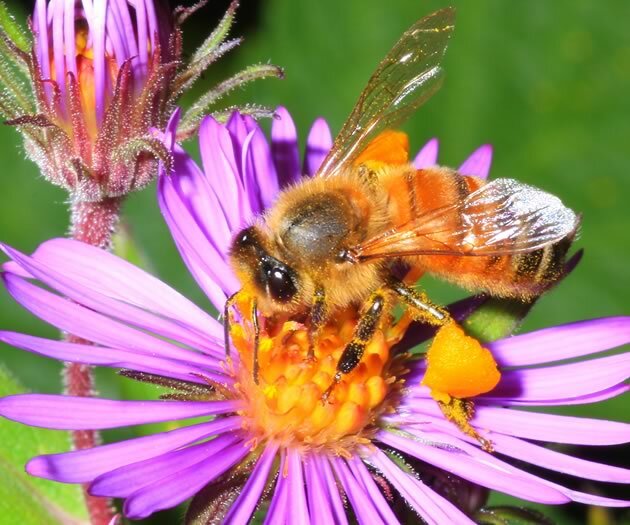 A global decline in honeybees has been blamed on culprits including the varroa mite, which has hopped from Asian to North American bees; agricultural pesticides including neonicotinoids; and a worldwide loss of foraging territory for bees. As part of their all-natural, bee-first philosophy, Heritage Bee leaves 125 to 150 pounds of honey in each hive to sustain the bees over the winter – more than conventional or commercial beekeepers would. Many remove all the honey they can, replacing it with sugar water to keep the bees going when it’s too cold for foraging. If a colony doesn’t produce enough surplus in any given year to meet the client’s contracted number of jars, Debbie and Jeff will provide honey from their Mulmur headquarters – though this has never happened. Every spring Heritage Bee removes whatever surplus is left in the hives to sell in local shops. 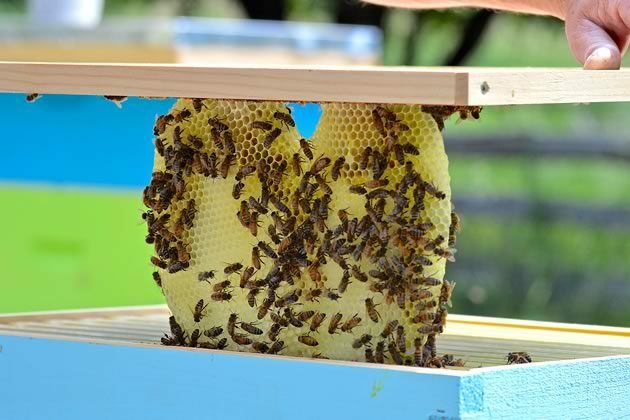 Last season 50 per cent of all Heritage Bee’s hives provided a surplus. Indeed, Heritage Bee eschews many of the hallmarks of modern beekeeping, including treatments with synthetic chemicals, over-harvesting and the supersized bee itself. You’ve heard of heritage seeds and heritage breeds of pigs and cows. This is the bee version. “We regress the bee to the size it was a hundred years ago,” says Debbie. 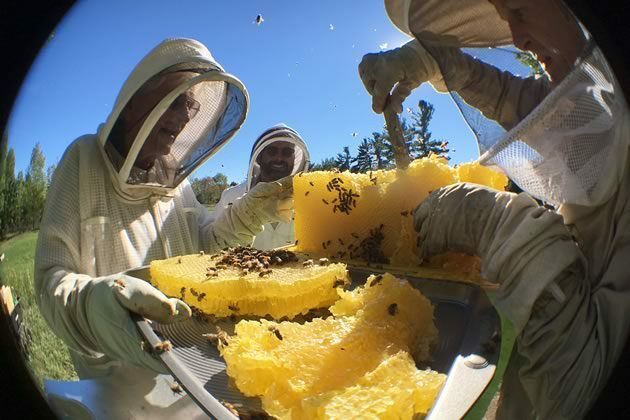 Though conventional beekeeping has capitalized on the ability of the larvae to grow to fit the size of the honeycomb cell their eggs are laid in – bigger bee, more honey, goes the logic – small-cell beekeeping involves returning the honeybee to its natural dimensions by using a 4.9-mm cell rather than a standard 5.4-mm cell. This is said to reduce the bees’ susceptibility to disease and pests and may lead to better winter survival rates, which has been Heritage Bee’s experience. Overall, the Ontario honeybee population decline appears to have levelled out somewhat, with losses during the winter of 2015–2016 estimated to be 18 per cent, compared to the average of 31.5 per cent from 2005 to 2015, reports the Ontario Ministry of Agriculture, Food and Rural Affairs. 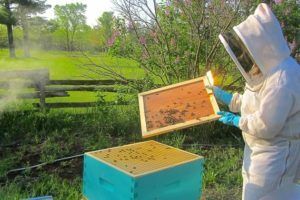 The threat of decline is a major factor in beekeeping’s arrival as the latest DIY homesteading trend. Beekeeping is the new chicken raising. 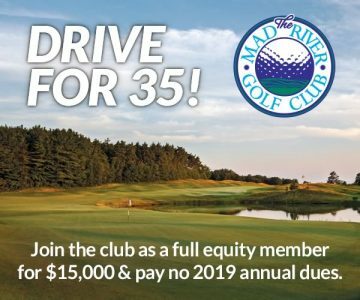 Heritage Bee’s “hightouch” business, as Jeff calls it, has already surpassed its 2017 goals threefold, and the 2018 client list is already filling up. Erin neighbours Catherine Mullen and Sarah Chambers split the cost of sharing the two hives placed on Catherine’s property. While they’re excited about tasting their own honey, they’ve bought into the broader ecological goal of restoring bee populations. Early in the season they were already thinking about how they will enjoy sharing what they learn with their own kids – they have five between them. “What a great way to show our kids what we can do for the bees and what bees are capable of,” says Catherine. Beekeeper Jeff Chalmers shares his beekeeping know-how with a visitor at Heritage Bee Co.’s main apiary. Photo by Debbie Gray. After checking out the wild bees, Debbie and Jeff lead me to the cluster of brightly coloured hives. I can see the one hive that has failed to survive. It’s just a single wooden tower, waiting to be built up again. Each of Jeff and Debbie’s colonies lives in a tower made of separate layers, each holding 10 removable frames that hang like vertical files. The bottom two layers are brood boxes, the “baby nurseries” that are home to the queen and her entourage. Above these boxes is the “honey super,” the frame dedicated to producing the honey for harvesting. The nine other hives are buzzing as bees fly orientation missions in and around the hives. Debbie points out they look a little drunk, flying in circles. They will quickly use colour and pattern to remember which colony is home, she says. Gingerly lifting the honey super off one hive to look inside for the first time this year, Debbie sees it’s packed with bees building honeycomb on the trays. She calls Jeff over so he doesn’t miss it, “Look at them, Jeff!” The duo quickly close up the hive, as the bees aren’t happy about being disturbed, even though Debbie has used a smoker to calm them. “Bees have personalities – some are highly defensive, some docile, some are excessive groomers, which is a desirable trait,” she says. The topic is endless. Bees, for instance, really do make decisions en masse, such as choosing which female egg will become the next queen when the current queen starts to fail, a judgement communicated via message-laden pheromones. Bees also seem to “shop” for particular ingredients their hives need, flying over some blooms in favour of others if they offer a particular nutrient or benefit. Beekeeper Debbie Gray removes a hive’s inner cover during an inspection. Photo by Jeff Chalmers. Along the way Debbie and Jeff are also keen to explain the more mundane side of apiculture to their clients, keeping them on the right side of the various bodies and laws governing beekeeping. 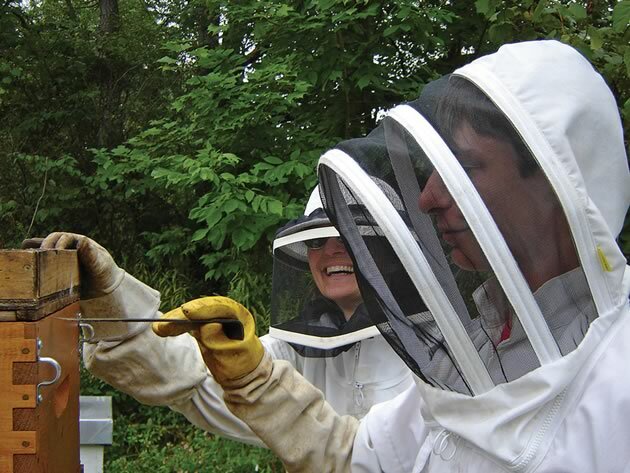 Whether the hive is on their property or yours, Debbie and Jeff handle all the mandatory registrations, inspections, permits and labelling required by the agriculture ministry under the Ontario Bees Act and other legislation – all designed to ensure the bees are protected from disease and pests and that honey remains uncontaminated. If you own bees, you must register annually with the ministry and place hives at least 30 metres from a property line and at least 10 metres from a highway. Debbie and Jeff also stay on top of disease and pest management, all without using synthetic chemicals, which can be time-consuming. Inside the bright and pristine honey house, where honey extraction and production take place, are enormous, shiny stainless steel machines. One uncaps the honeycomb to allow the honey to flow. A giant centrifuge extractor (paid for in part by a joint federal-provincial grant through the Growing Forward 2 program) separates the honey from the wax. There is also a clarifying tank, where impurities are skimmed off. New this year is a machine to make creamed honey. “My favourite!” says Debbie. 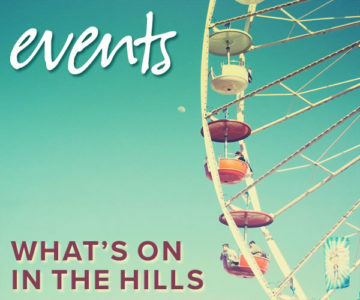 The summer will be busy. Then in the fall, “you host” clients can end the relationship, and Debbie and Jeff will remove their hives. Or the client can continue, with a reduction in their annual servicing fee, and the pair will prep and insulate the hives for winter. About 10 to 15 per cent of Heritage Bee’s clients want to step up and become full-fledged beekeepers themselves, and Debbie and Jeff are in the throes of finishing the paperwork that will permit them to meet this demand. “A permit is required to sell used beekeeping equipment in Ontario,” says Debbie, adding that harmful spores, bacteria and diseases can live for decades on old woodenware and extraction machinery. phalia they named Marigold, which they use for travel during the off-season. 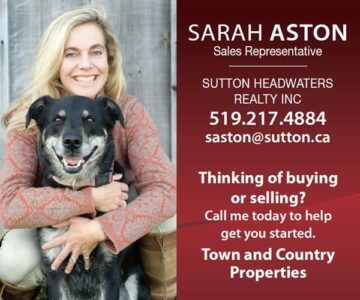 What sealed the deal, however, was that both were yearning to step back from hectic, type-A city life – he in the aerospace industry and she in venture capital sales and marketing – to try their hand at some form of animal husbandry or other rural pursuit. 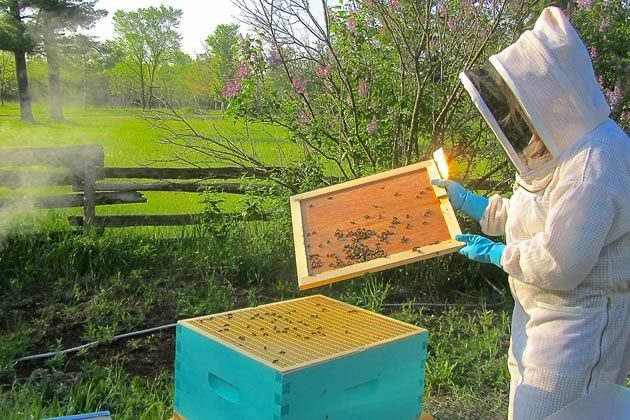 “Working with bees checks so many boxes: working with animals, working outside, and being part of a wonderful community of people who are interested in stewardship,” says Debbie. Each had a little history in Mulmur: Debbie had rented a place here, and Jeff’s great-grandfather ran a shoe store in Shelburne. 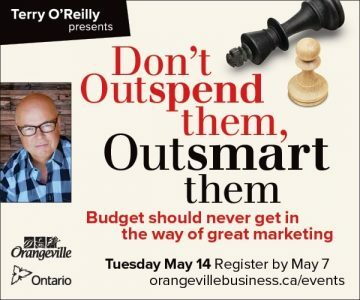 With five kids aged nine to 18 between them – as well as Marigold, whom they playfully call their sixth – they maintain a house in Toronto too. The kids join them on the farm on weekends and during the summer. Now the new True Grit exhibition at Dufferin County Museum & Archives has hailed the duo as community stalwarts in the tradition of the farmers who came before them. And they’ve gravitated to like-minded souls. 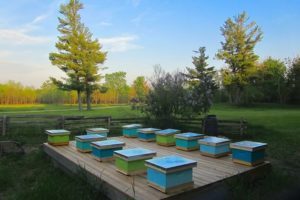 Debbie and Jeff cofounded an informal natural bee group called Bee Natural Caretakers, believed to be the first synthetic chemical-free beekeeping group in Ontario. Debbie is the current president. 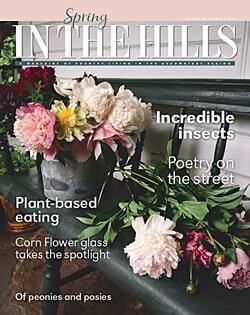 Though Debbie and Jeff can’t single-handedly fix the plight of the honeybee, they are throwing everything at boosting its chances close to home. They like to imagine a robust corridor of bees hugging the length of the Niagara Escarpment. “We hope that in our own little way we’re pioneering a healthier, more sustainable approach to supporting the bees,” says Debbie. apiary / A place where honeybee colonies are located, also known as a bee yard. crystallized honey / Raw unadulterated honey can readily harden and crystallize. This process is normal and easy to reverse. Just place the jar in a pot of warm water and leave it for a while. drone bees / All male, their sole purpose is to procreate with the “virginal” queen on her mating flight. They make up 10 to 20 per cent of a colony. mating flight / The flight made by a virgin queen when she mates in the air with several drones in undisturbed areas, usually at a much higher altitude than where most foragers fly. These are known as drone congregation areas, or DCAs. migratory beekeeping / To facilitate food production and monocrops, honeybee hives are transported throughout North America to pollinate crops such as almonds and blueberries. Because there isn’t enough food throughout the year to sustain local bees for these pollination events, other bees are imported for short periods. nectar and pollen / Nectar is a sweet substance some plants produce to attract pollinators, including bees, butterflies and hummingbirds. Pollen is a fine powder produced by male flowering trees and plants. When pollinators collect nectar, they also transfer pollen from male flowers to female flowers, fertilizing them to produce seed. Honeybees use nectar to make honey. Pollen is the only source of protein, starch, fat, vitamins and minerals in a colony’s diet. By weight, pollen has more protein than beef, according to Kim Flottum, editor of Bee Culture magazine. neonicotinoids / A controversial category of agricultural insecticide believed to be linked to honeybee and bumblebee population decline. The Canadian government is seeking to phase out a number of neonicotinoids, and Ontario has moved to phase out the blanket use of these insecticides on corn and soybean crops. polyfloral honey / A term that suggests bees had a buffet of wildflowers to choose from instead of being forced to collect pollen from a single flower source to produce a specially flavoured honey, sometimes via migratory beekeeping. Considered a more sustainable way to produce honey. propolis / Sap or resinous material collected by foragers, then mixed with enzymes and used to seal cracks and smooth rough spots in the hive, and to strengthen the wax comb. Also known as bee glue. queen bee / There’s only one per hive. She’s the only fertile female and the mother of all the others, laying up to 3,000 eggs a day over a lifetime of three to five years. If she dies, is killed or is failing, fewer queen pheromones are recognizable to her colony, so the colony will attempt to raise a new queen. royal jelly / A highly nutritious glandular secretion of young bees, used to feed the queen and young brood. supersedure / The natural or emergency replacement of an established queen by a daughter in the same hive. 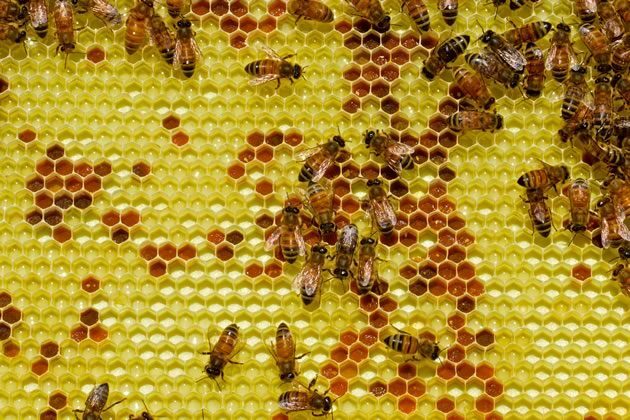 swarming / A natural event that occurs when the queen and half the colony leave the parent colony to establish a new colony. You may see them hanging in a tree before they move into a more permanent space. varroa mite / A parasitic, blood-eating mite that appears in the adult and pupal stages of honeybees. Cited as one of the major threats to honeybees because high mite populations weaken and destroy colonies and can transmit other diseases. worker bees / All infertile females, their gestation is 21 days. They live up to seven weeks during the active foraging season. Winter bees – the workers that keep the hive going over the winter – live much longer: up to six months. 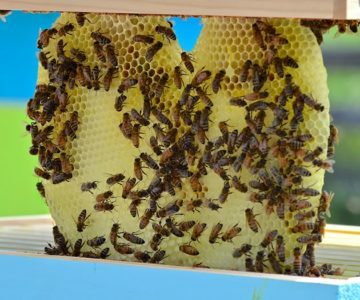 Worker bees comprise 80 to 90 per cent of the colony and rotate through jobs, including gathering nectar and water, housekeeping, nursing, cell building and guard duty. 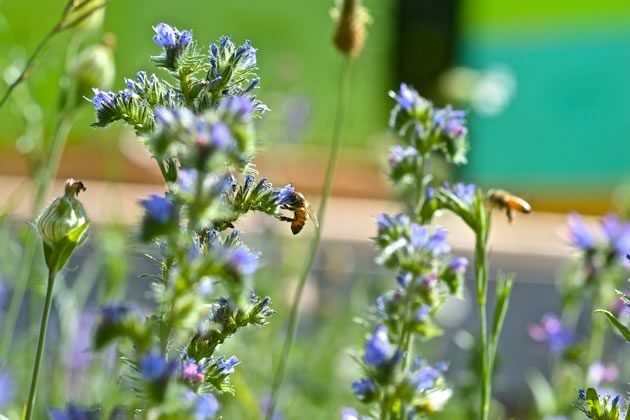 Debbie Gray and Jeff Chalmers’ favourite bee-friendly flora. dutch clover / A bee-friendly lawn alternative. maples trees / Maple buds provide an early and important food source. dandelions / Another early food source. A reason not to stress about mowing them until they finish blooming. creeping thyme / A recognized and recommended organic treatment with antimicrobial properties for controlling varroa mites and other pests and diseases in the hive. Bees also love anise hyssop, flowering raspberry, wild lilac, lavender, sedum, serviceberry clump (shrub) and New England aster. 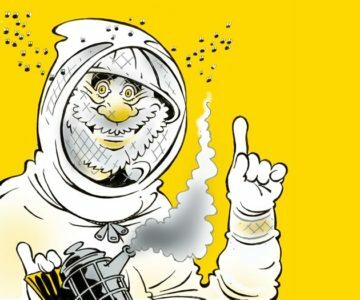 Anthony Jenkins on how he dove into beekeeping head first – and emerged (relatively) unscathed. We need to learn more about honeybees and other pollinators so we can contribute intelligently to the conversation about their health and well-being. When I walk into my yard I am greeted by a gloriously diverse menagerie of tiny winged creatures. I sowed my back forty (approx.50 ft. x 50 ft.) back area in Barrie, with White Clover. I originally did this because I found it difficult to keep up with the weeds which seemed to thrive in the sandy, yet acidic soil which is partially under 100 ft. fir trees. The White Clover has filled in, and I haven’t mowed it. I understand it’s best to wait until it’s finished blooming. The Clover is quite difficult to walk in, but my little Jack Russell X dog seems to enjoy it. I haven’t noticed any amount of Bees as yet – can I expect to, and if so, will my neighbours be compromised by Bee visits to their yards? I have seen what appears an increase in what I call Bumble Bees around the wild Lilly of the Valley flowers. Ideally you wait until it blooms. Bees – both honeybees and other pollinators – love clover. If you can wait before you mow, you will likely attract all sorts of different bee species. Keep in mind that honeybees are gentle insects, focussed exclusively on foraging for nectar and pollen. 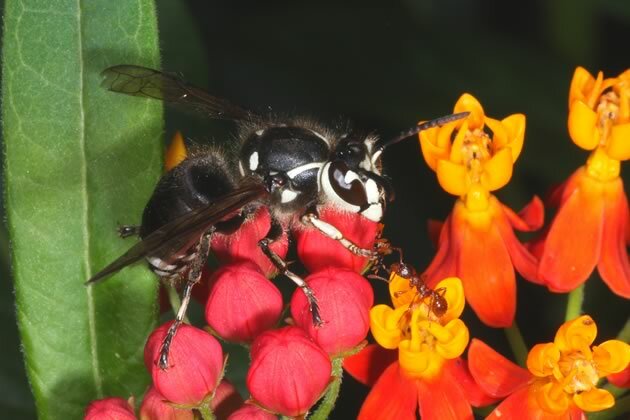 They are not typically aggressive and often are mistaken with wasps/hornets. It is a beautiful thing to see a fuzzy honeybee on a flower. Thank you for taking steps to help restore habitats for the bees. While creating a fun play area for your Jack Russell!